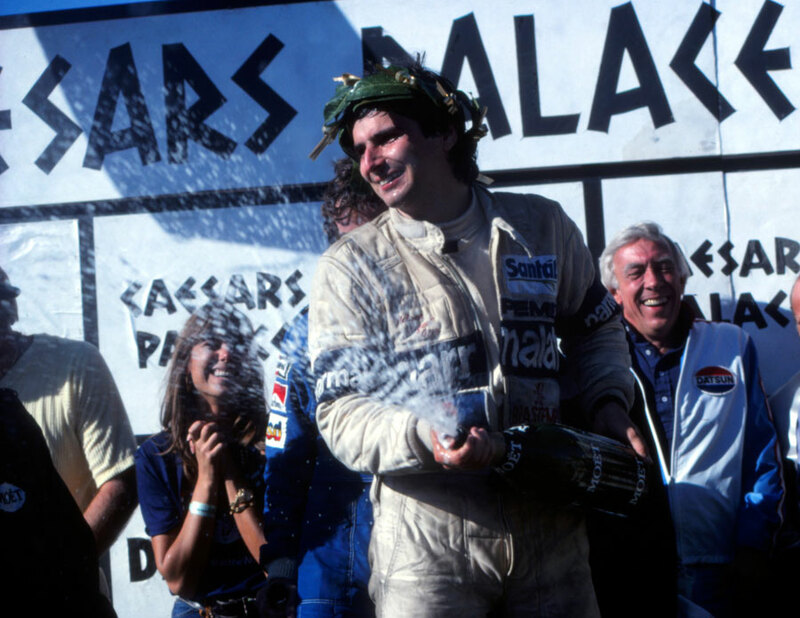 Nelson Piquet claimed the world championship thanks to a fifth-place finish in Las Vegas, the two points it brought enough to put him one point clear of Carlos Reutemann who was back in eighth. Alan Jones, who had announced his retirement three weeks earlier, signed off with an impressive victory and some stinging attacks on his rivals. The setting for the season finale was hardly classic Formula One - the circuit wound its way through casino car parks with the surreal backdrop of signs advertising shows by Sammy Davis Jnr and Dean Martin and the delights of 24-hour gambling. Purists were unamused the official title of the race was not that of the host country but of the casino staging it. Reutemann arrived as the bookmakers' favourite, holding a one-point lead over Piquet with Jacques Laffite, a further five points back, the only other driver in with a chance of the title. Reutemann took pole alongside Jones with Piquet on the second row and Laffite languishing in 12th. Jones had nothing to play for in terms of the title, but he wanted nothing more than to ensure his team-mate did not win the crown. There was no love lost between them and everyone knew it. Asked before the race if he wanted Piquet or Reutemann to win, he allegedly replied: "It's take your pick between TB and cancer. I couldn't give a damn." Jones stormed off the line and led throughout, but the real drama all happened further down the field. Piquet at one point dropped to eighth, but Reutemann, who had been a bundle of nerves, seemed utterly out of sorts and had moaned about handling issues during the warm-up. He lost four places on the first lap and then shed fourth gear and was passed by a succession of cars. He had Piquet behind him until the 16th lap. "I could see his car was not handling well and there was someone catching me, so I had to make a move," Piquet said. "Carlos seemed to make it very easy for me. He braked early one corner and I was through. No problem." Piquet, who had badly bruised his shoulder when he hit it against the side of the cockpit early on, was in increasing pain and had to be lifted from his Brabham at the finish. He had also been sick in his helmet in the final stages. "When 33 laps to go were signalled I nearly died," he said. "By then my head was going out of the car at the bends. I was almost finished … my back and right shoulder were in agony." Jones, like all other drivers, was also physically challenged by the layout of the circuit with a string of high-speed left turns, but admitted afterwards his happiest moment came when he lapped the hapless Reutemann. And although he congratulated Piquet at the end, he then made clear to journalists that he had no time for either driver. Asked if he would reconsider his retirement, Jones replied: "You never know … I doubt it but if Frank [Williams] let's me miss Argentina …"
Almost unnoticed, Alain Prost took second with Bruno Giacomelli third. Villeneuve's brother, Jacques senior, entered the race but failed to qualify.